Click Here To Listen Inside A New Separate Tab So You Can Come Back To This Current One To Continue Browsing The Site/Internet If You’d Like! Your Distance from our Station? Enter your zip code OR address to determine your distance to the station. In some cases, your general relative location may automatically load for you. We currently have coverage about 80 miles from the station (see the map to the right showing the relative service area for Local AM Reception). Listen Live Now on our website, however, 24/7 worldwide! 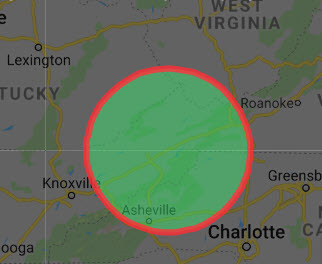 Local AM Reception is currently about 80 miles from the station located in Bristol, VA USA. Remember, though, now you can Listen Live Now on our website 24/7 worldwide as well. How do you get the best local AM reception? If you are trying to listen to an AM radio station that does not broadcast in your direction, chances are very slim that you will have much luck. Also, if your antenna is not directed correctly at the signal coming your way, you will also experience bad reception. Ideally, your antenna should be at right angles to the AM signals coming toward it. Think of it in terms of trying to hit a baseball with a bat. Even if you are a great hitter, it is difficult to hit a pitch with the narrow tip of the bat. Sure you might come close, but you will never make a good solid connection. The same is true with radio signals that are not hitting your antenna. Try rotating the radio in a circular fashion, and maybe even relocating the radio to find the best reception. The AM antenna is actually inside the Receiver. The long ‘pull-out’ antenna is for FM.